YANGON — The recent arrest of two Reuters journalists, Ko Wa Lone and Ko Kyaw Soe Oo, under the British colonial-era Official Secrets Act has raised anxieties about shrinking press freedom in Myanmar. Local journalist networks and news organizations strongly criticized the arrest as the latest attack on the press and called for the pair’s immediate release. “We journalists absolutely believe that journalists have the right to travel to conflict zones as well as gather information from relevant sources in order to produce accurate reports,” a joint statement from 12 journalists networks said. The pair’s arrest is but the latest in a growing list of cases of journalists being taken to court by some of the country’s most powerful institutions, including the military. A total of 11 journalists were arrested this year under various repressive laws, including the Official Secrets Act and the Unlawful Associations Act, and on defamation charges for gathering information or travelling to conflict areas for their work and for criticizing officials. Here, The Irrawaddy has compiled a list of the reporters arrested in 2017. Reuters journalists Ko Kyaw Soe Oo (left) and Ko Wa Lone. Two Reuters journalists, Ko Wa Lone and Ko Kyaw Soe Oo, were detained on Tuesday night after being invited to meet with police officials on Yangon’s outskirts for possessing police reports containing detailed information about the fighting between government troops and the Arakan Rohingya Salvation Army in late August 2017. Two policemen were also arrested for allegedly providing the documents to the reporters. The police opened the case under the Official Secrets Act’s Article 3, which allows for prison sentences of up to 14 years. The policemen were charged under both the Official Secrets Act and the Myanmar Police Force Maintenance of Discipline Law. Turkish state broadcaster TRT World Producer Mok Choy Lin, from Malaysia, freelance camera operator Lau Hon Meng, from Singapore, and two Myanmar citizens — their interpreter Ko Aung Naing Soe and driver U Hla Tin — were detained on Oct. 27 for attempting to fly a drone near Myanmar’s Parliament in Naypyitaw. They were sentenced to two months in jail by a Naypyitaw court on Nov. 10 under the 1934 colonial-era Myanmar Aircraft Act for filming with a drone. They were also charged under the 2012 Export and Import Law for illegally bringing the drone into the country — which carries a penalty of up to three years in prison. The two foreign journalists were also charged with violating Section 13 (1) of the 1947 Immigration Act on Nov. 27, after their visas expired while in custody. The Irrawaddy’s senior reporter Lawi Weng, also known as U Thein Zaw, and Democratic Voice of Burma reporters U Aye Nai and Ko Pyae Phone Aung were arrested by the Myanmar Army on their way back from a reporting trip to northern Shan State on June 26. They traveled to an area controlled by the Ta’ang National Liberation Army to cover a drug-burning ceremony marking a UN-designated day against drug abuse. The military filed the lawsuit against the journalists under Article 17 (1) of the Unlawful Associations Act and transferred them to Hsipaw Prison in Shan State on June 28, after they had been detained at an undisclosed location for nearly three days. After detaining the journalists for more than two months, the military withdrew its case against them on Sept. 1. 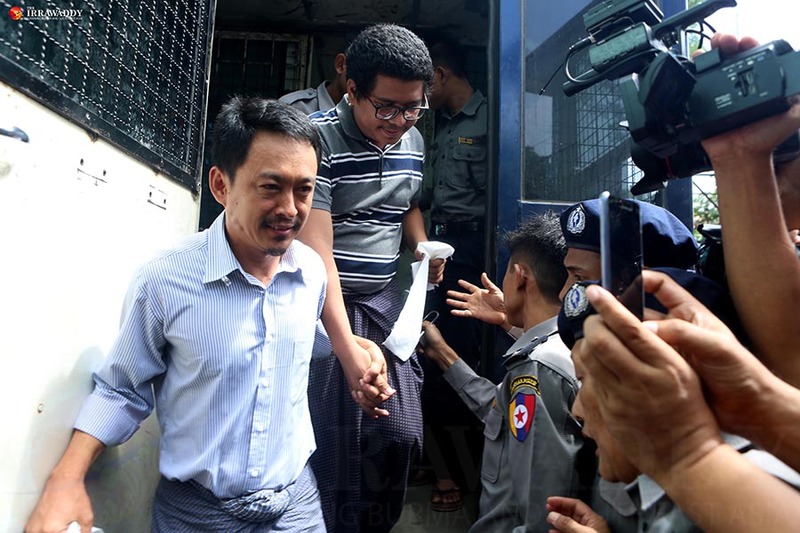 The Voice Daily Chief Editor U Kyaw Min Swe and satirical columnist Ko Kyaw Zwa Naing, also known by his pen name British Ko Ko Maung, were arrested by police on June 2 after the Myanmar Army filed a lawsuit against them. The pair was charged under Article 66 (d) of the Telecommunications Law and Article 25 (b) of the Media Law for allegedly defaming the military in a satirical article. 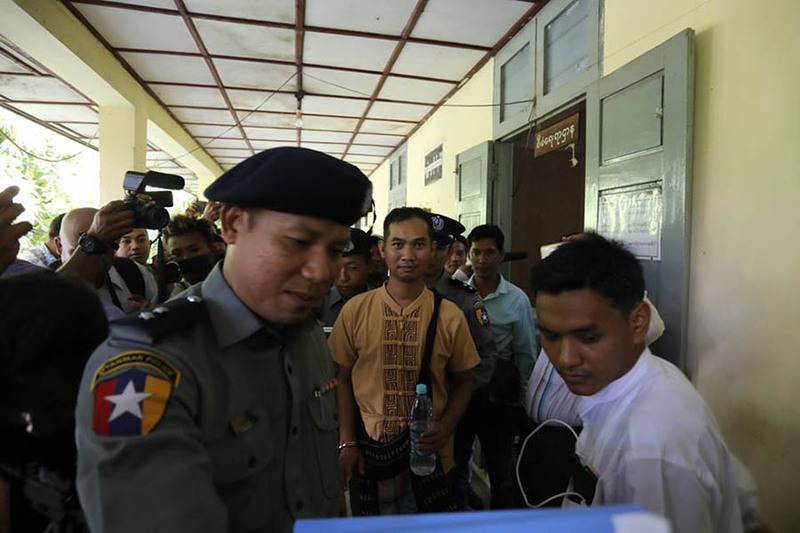 Ko Kyaw Zwa Naing was later released and then acquitted of violating Article 66 (d) on June 16. The military withdrew its case against them on Sept. 1. Myanmar Now Editor-in-Chief Ko Swe Win was arrested at Yangon International Airport on July 30 on his way to Bangkok for a short work trip ahead of a court hearing in Myanmar and transferred to Mandalay to face defamation charges. He was released on bail the next day. Ko Swe Win had two related cases filed against him in March. One was filed by a follower of ultranationalist monk U Wirathu in Mandalay. The other was filed by a nationalist in Yangon. Both accused him of insulting U Wirathu after he shared a Myanmar Now news story quoting a senior abbot saying the monk was no longer in the monkhood because he had praised the assassins who killed National League for Democracy legal adviser U Ko Ni. The latter case was later dismissed by a judge. The former is currently at trial.